Chocolate Cream Thumbprints - Dessert Now, Dinner Later! 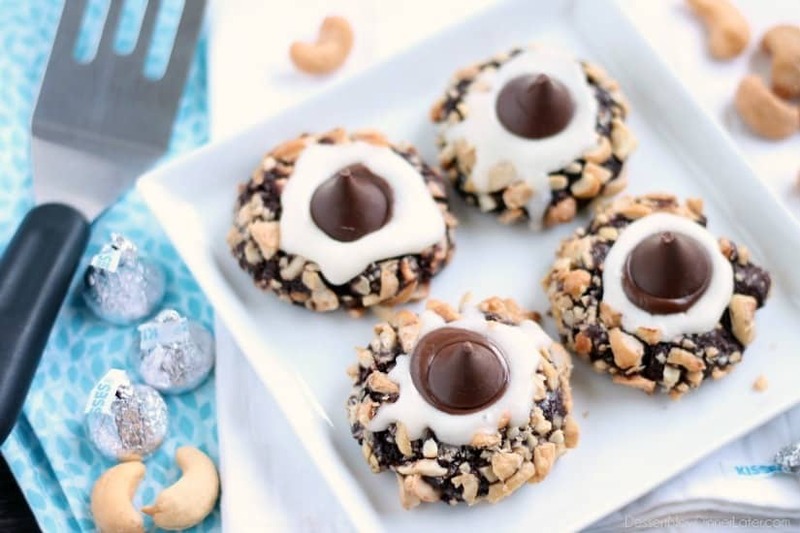 Chocolate cookie dough is rolled in nuts and topped with buttercream and chocolate kisses to create these thick and chewy Chocolate Cream Thumbprint Cookies. I’m kind of obsessed with thumbprint cookies! 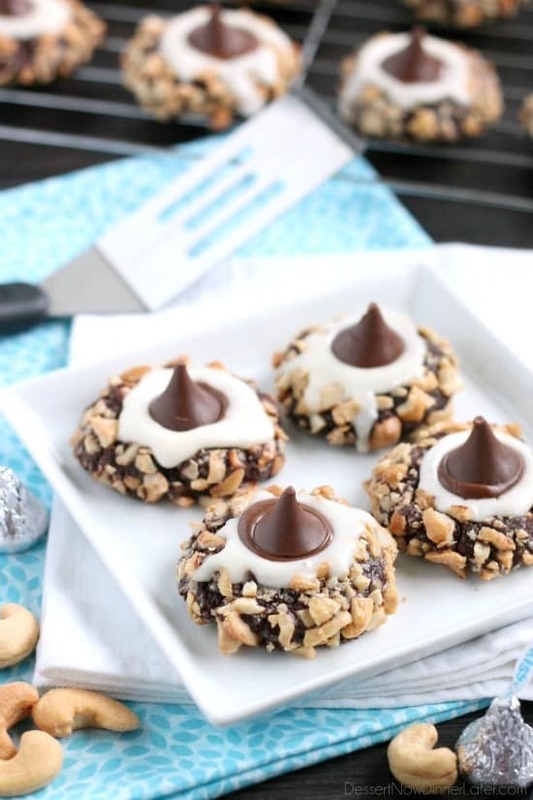 I just love that you can make pretty much any flavor combo you could want with the variety of Hershey’s kisses out there, especially with all the Christmas and holiday flavors going on right now. 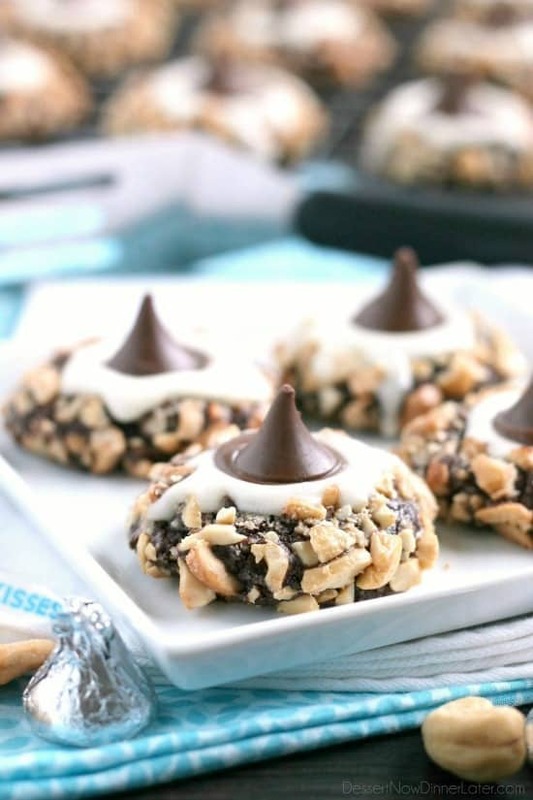 Today we are actually just going to stick with plain old milk chocolate kisses, but the special addition to these, is the buttercream underneath them. I’ve made this chocolate base before for my turtle thumbprints. It’s so incredibly thick, soft, and chewy. It’s a great base to play with. I decided instead of pecans or walnuts that I wanted to use my favorite nut to dip it in: cashews. You can totally use whatever nut you prefer though. 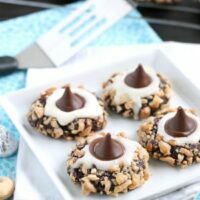 Like most kiss cookies, I put my chocolate on while the cookies were warm to melt the chocolate a little bit, but then I lifted it back up, squeezed some buttercream underneath, and put the chocolate kiss back in the center. It really makes it mouthwatering to see the melty chocolate. The results are a super delicious cookie with crunchy nuts to balance out the decadent chocolate and sweet buttercream. These chocolate cream thumbprints are soft, yet sturdy and totally easy to make! I’m ready to whip up another batch myself! Enjoy! Cream the butter and sugar together. Add the egg yolk, milk, and vanilla. Mix until combined. 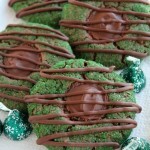 Meanwhile, unwrap the chocolate kisses and prepare the buttercream by whisking the ingredients together in a small bowl. Scoop the buttercream into a zip-top bag and cut off the corner. Make 24 round balls with the chocolate cookie dough. Whisk the egg white until foamy. Dip the cookie dough balls into the egg white and then into the nuts. Cover each cookie dough ball completely. Place nut covered dough balls onto a prepared baking sheet (lined with parchment paper, a silicone baking mat, or greased with pan spray). 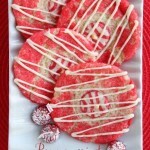 Make an indent in the top center of each cookie with a ½ teaspoon measuring spoon. Bake at 350 degrees Fahrenheit for 10 to 12 minutes. Allow to cool slightly (5 minutes) before transferring to a cooling rack. 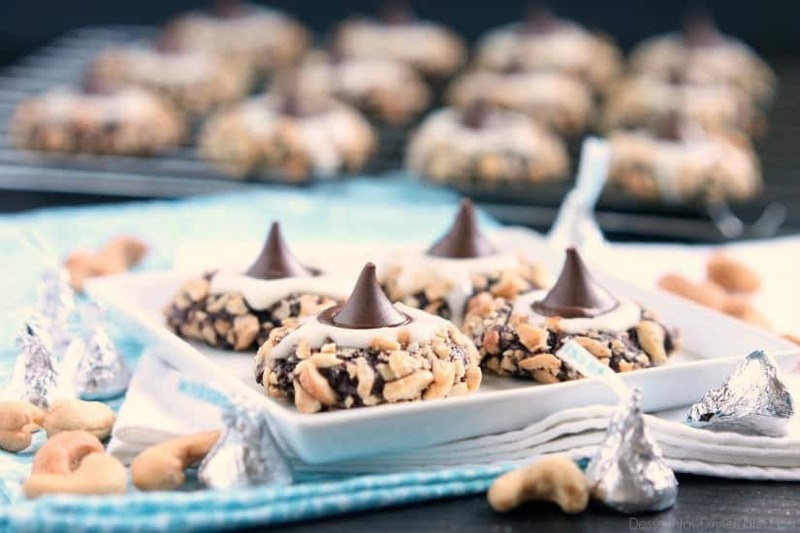 Place milk chocolate kisses in the center and allow to melt slightly (1 or 2 minutes; long enough for the bottom to melt, but the top is still solid). Lift the chocolate kisses back up and pipe/squeeze some of the prepared buttercream into the center of the cookie. Place the chocolate back on top. Allow cookies to cool completely. Store in an airtight container up to 5 days. Yep, I would totally keep all of these for myself! Haha! It’s hard not to eat more than one, that’s for sure! I “accidentally” ate my daughter’s cookie I had saved for her, but in my defense she wanted a fruit snack for dessert instead, so I went for the cookie. Haha! 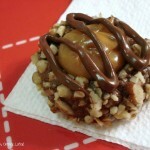 Thank you for adding the photo to the recipe print page. When I’m looking for something to bake, the photo is a real asset! How cool – this would make a great treat for me to bring to my next family gathering. I’m going to make a batch for myself first and see how they turn out. Thanks Amber! I hope you love them Jeff! 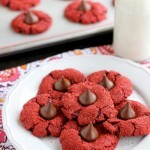 They are pretty easy and so delicious!